Kendra Chubbuck had a problem. She wanted to move to Isle au Haut to live with her fiancée, John DeWitt. She sold her home, quit her job in Wiscasset (CEI, inc) and was ready to go. The only problem? Maxwell. 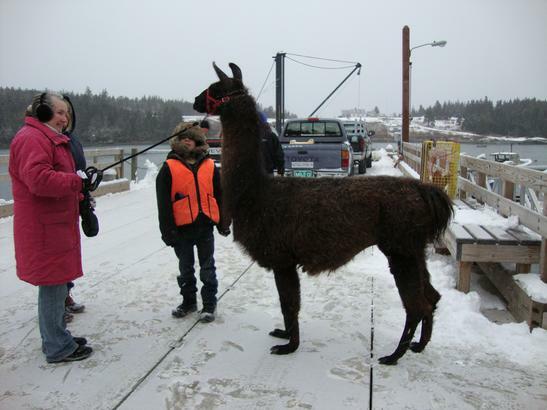 Maxwell is her 16-year-old llama. Chubbuck has owned Maxwell since he was 8 months old. 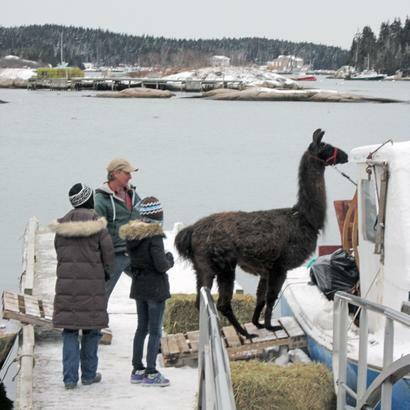 One reason Chubbuck didn’t want to bring Maxwell to Isle au Haut is the llama’s susceptibility to the meningeal worm, a parasite carried by deer on Isle au Haut. However, the vet has inoculated Maxwell with a double-dose of a vaccine to help ward off the parasite. 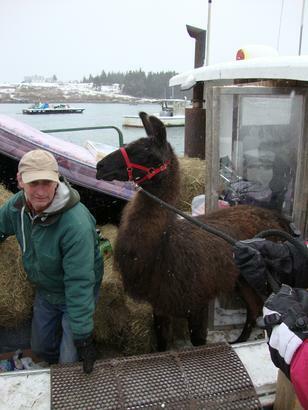 The second reason Chubbuck was wary of bringing Maxwell was practical—how do you transport a llama to an island? The answer, it turns out, is on her fiancée’s lobster boat on a calm day in January. 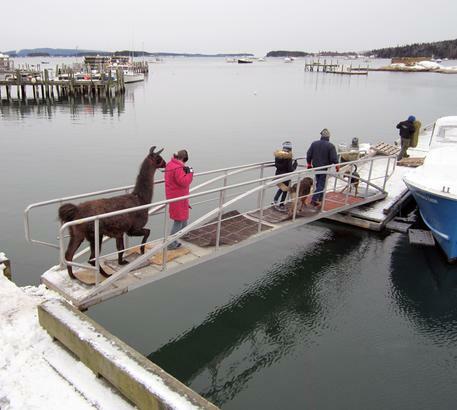 On Saturday, January 21, Maxwell and his close friends (two geese, a baby duck and a dog), several people and the rest of Chubbuck’s belongings packed into DeWitt’s lobster boat, F/V Barbara Anne. 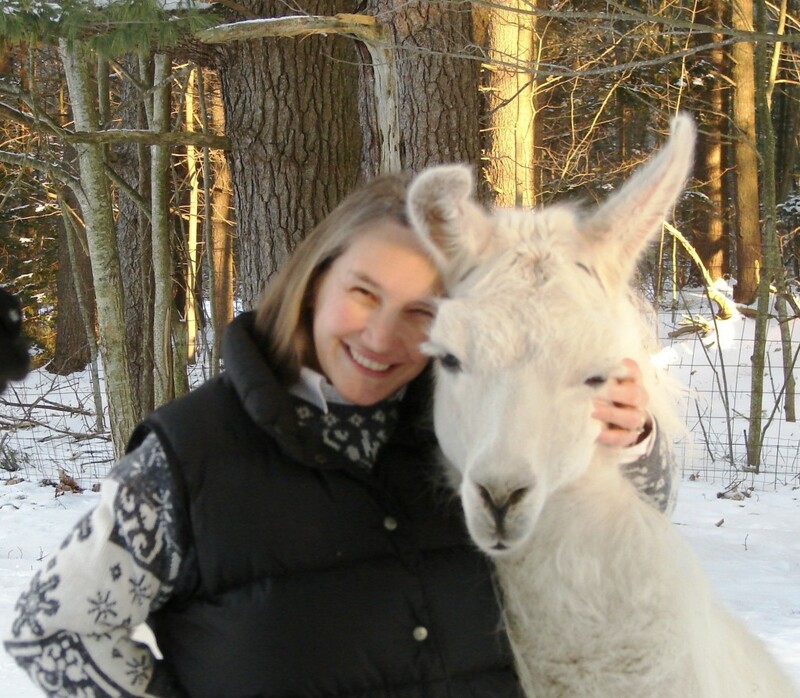 Llamas can live into their mid-20s, and make wonderful pets, according to Chubbuck. “They’re curious, good guard animals and hard to make mad,” she said. She was nervous about the trip because llamas can be sensitive to stress, but the llama seems to be settling in well, she said. “I think he likes it here,” said Chubbuck, whose family, including her great-great-grandmother, is from Isle au Haut. Chubbuck plans to open a gift shop with DeWitt just off the public landing. The Shore Shop, as it will be called, will open Mother’s Day weekend and specialize in Maine-made goods. Chubbuck may bring Maxwell down to play near the shop. “He loves people,” she said of the llama, who has marched in parades, visited nursing homes and a school and once even appeared at a Barnes & Noble open house. “He’s very friendly and walks better than my dog on a leash,” she said of her pet. For now, Chubbuck says, she is going to plan her small wedding and the opening of the shop and let Maxwell adjust to his new home. In Loving Memory of Birch, March 19, 1995 – October 20, 2008. He is greatly missed. Please Support Women-Owned & Veteran Owned Businesses!